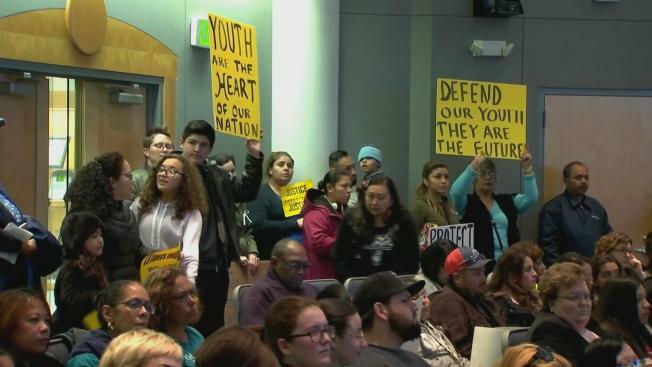 A Hayward teacher is under investigation for allegedly chastising students who participated in the nationwide "A Day Without Immigrants" strike. Parents at Cesar Chavez Middle School said they allowed their children to stay home when the boycott was held last week. "We will not be silent," 13-year-old Franco Tonatiuh said. The student, classmates and parents decided to speak outside Hayward's City Hall late Wednesday to discuss the incident. Students said they were humiliated when they came back to class after missing one day of school while participating in the national boycott "A Day Without Immigrants." "She started pointing to everyone telling the same exact question: 'Why weren't you here?'" Franco said. "Everyone had the same exact answer -- the boycott." Franco said the English teacher kept pressing the issue. "She was trying to say we're very dumb, our parents are for letting us come to school," Franco said. The teacher also told students to grab their work and go to a different class, according to a parent. Lisa Davies, director of academics at Hayward Unified School District, said the district's human resources department is conducting a full investigation. The district will take action on the results from the investigation, Davies said. The interim superintendent at Wednesday night's school board meeting apologized on behalf of the board, adding the incident is under investigation. Trustees went on record reminding the audience Hayward Unified is an official safe haven for all immigrants.